In contemplating this article, the question becomes “who loves radiant floor heating?” First, if you have ever been around radiant floor heating you know that the clients love radiant floor heating. It is without a doubt the most comfortable way to heat. There is nothing like walking around barefooted on 82 degree floors when it’s cold outside. Radiant means no air blowing around in the space. The heating system is not usually talked about by customers unless they’re bragging, because the heated area is so comfortable you don’t even notice how comfortable you are. I guess the best way to explain it is there is no ‘uncomfort’ to remind you that you are heating. 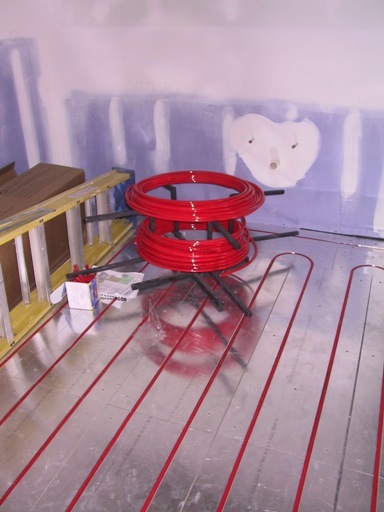 Today, radiant floor heat is designed and insulated to be up to 40% more efficient than forced air gas heating. With high efficiency modulating boilers, insulation above or below the subfloor, and radiant reflective decking materials with grooves to accommodate the tubing, these improvements have eliminated the early issues. Second, contractors appreciate the profit that can be made. Clients don’t mind paying for it because ‘that comfort’ is what they want. Third, the servicing contractor understands that once the job is commissioned correctly, it’s a simple way to provide real comfort. 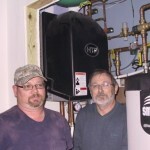 With today’s installations, there are very simple and reliable pumps and boilers that are easy to repair or replace. That’s really all there is to circulating warm water. 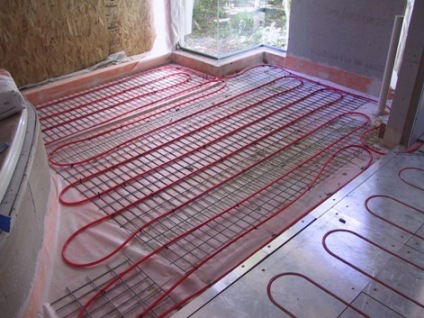 Years ago, floor heating consisted of copper or steel tubing entombed in a concrete slab. 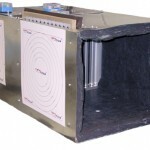 This system was expensive, was inefficient and took a long time to heat (hours) and a long time to cool (hours). Over heating was probable and it took a while to warm up. Also, a water leak meant hammering up the slab or abandoning that part of the system. Today, those issues have been eliminated. We don’t poor a slab or even a layer of light weight concrete to encapsulate the tubing anymore. The temperature changes quickly if you don’t have all that mass. Today’s bpex and pex al pex tubing are designed to be perfect for 50 years or more. Known as crosslinked polyethylene, pex is part of a water supply piping system that has several advantages over metal pipe (copper, iron, lead) or rigid plastic pipe (PVC, CPVC, ABS) systems. 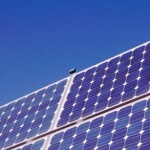 It is flexible, resistant to scale and chlorine, doesn’t corrode or develop pinholes, is faster to install than metal or rigid plastic, and has fewer connections and fittings. If you happen to accidently put a hole in it, it can be repaired for hundreds, not thousands. The subject home that is showcased in this article was suggested by the architect to the client. He contacted the manufacturer who contacted Comfort Solution. We called Mike Bell with Bell Mechanical out of Baton Rouge, Louisiana. He and Marty had one question, why floor heat in Southern Louisiana? For that answer please refer back to the top of the page. 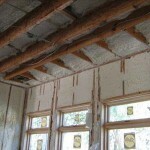 After much discussion the architect wanted to insulate the subfloor with very firm two-inch foam insulation board rated at R-10. 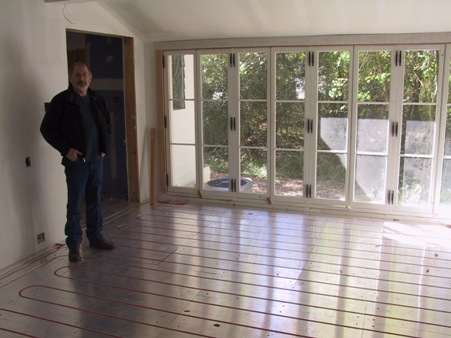 There are several different products that radiate heat up and out into the space instead of down into the subfloor. The architect chose a product called InFloorBoard. This board is made from 5/8″ particle board, has a thin layer of aluminum facing up, and it’s deminsions are 16″ x 48″. Grooves made into the board are 8″ apart and require 3/8″I.D. tubing. 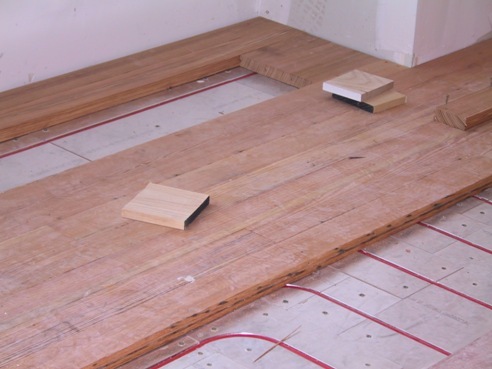 Infloorboard is laid on top of the insulation and is screwed down using three inch screws, through the insulation and into the subfloor. The Infloorboard was very carefully placed so that all of the tubing could be installed into the grooves that were made for the tubing. As the Infloorboards were butted together, the circulation pattern was applied to the floor. This laid a path for each water circuit. Each circuit should not exceed 200 linear feet and the tubes were 8 inches apart, so there could be multiple circuits in a room. The circuit begins and is terminated at the manifold. Each manifold represents a zone. It is imperative that the heating zone be the exact same space as the cooling zone. In other words, the rooms ducted for cooling from the ceiling must be the same rooms that are piped in the floor for heating. 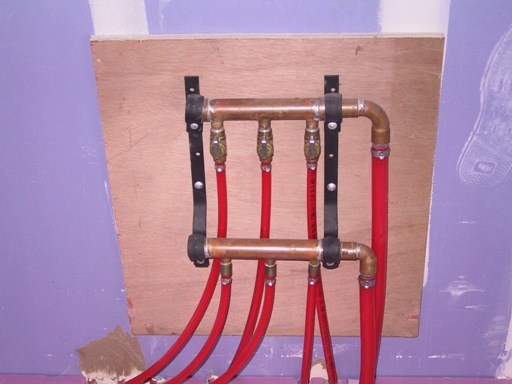 The tubing was laid throughout the home, including the shower. This custom shower has full length windows and open pier and beam construction so the decision was made to place the radiant tubing closer together. This would allow the owners to warm the shower floor at a different rate than the rest of the bathroom. Notice wire mesh was installed and the tubing was strapped to the wire mesh. Next, lightweight self leveling concrete is poured over the tubing. Finally, the finish tile was laid over the lightweight. Once the Infloorboard goes down, wood floors (in this case), carpet, tile, stone or just about anything except stained and scored concrete works fine as flooring material. Concern for nails being shot into the tubing is a justified concern. With wood floors, we had to be very careful. With most floating floor systems, the only nails are usually on the perimeter of the room. That makes shooting tubes less likely, but care must be taken. 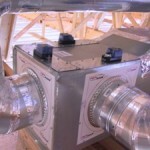 Since the floor installers can see the tubes, they should be able to miss the tubes. It is important to recognize where extra heat will be required on a cold day, like in front of lots of windows in the master bedroom. Here, we make certain the warmest side of the water circuit is making its way back and forth in front of the windows. The last half of the circuit is considered cooler so we work that part of the circuit toward the interior of the room. Comfort Solution will be on your design team and furnish the system design layout. 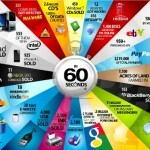 We will accompany you on the job, help you get started in the beginning and help get finished in the end. The mechanical board is mounted in a mechanical closet. Notice that we have six solenoid valves on the bottom right side of the board. That is where the water returns from the 6 manifolds out in the zones. 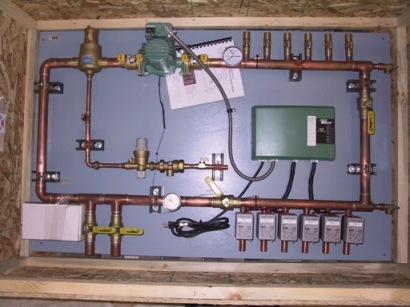 The six water valves at the top right are where water is pumped out of the board and into any zones calling for heat. The two large pipes with cut-off valves are the supply and the return to and from the hot water source. The green electronic box in the center is where the thermostats will terminate so that we control the solenoid valves based on the heating calls in each zone. This mechanical closet was a little tight for this job, but the guys at Bell Mechanical were more than up to the task. They made sure that they had access to the pumps, hand valves and boiler parts. Also, the SmartTank and expansion tanks were placed with care. 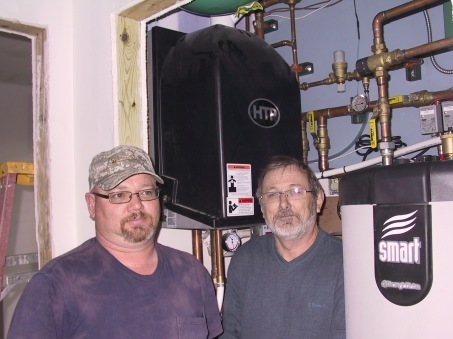 The SmartTank has two separate storage circuits that allow the boiler to store and produce domestic hot water and hot water for the floor with no crossover issues. 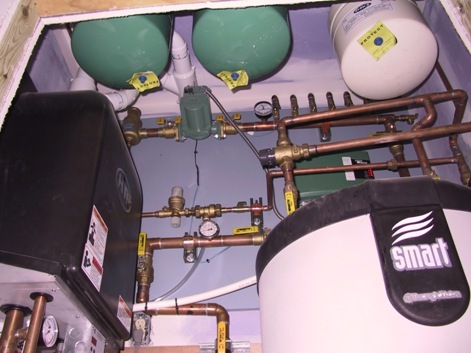 Code requires that you keep domestic hot water separated from the water that is circulated through the floor. This one hundred plus year old building was ready for a facelift, but I don’t think anyone realized how incredible the architect, Henry Boudreaux could make it look. 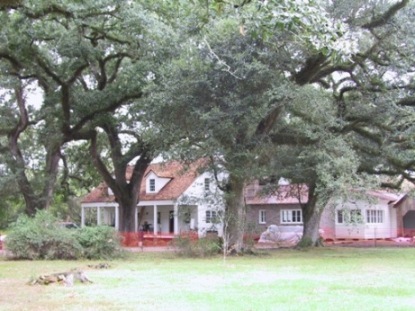 These huge live oaks were probably two hundred years old during the Cival War. Now that they are entering their retirement years, they will be dressing up a most wonderful and comfortable residence that we were proud to be a part of. 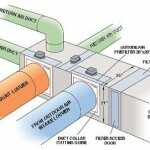 For more information on radiant floor heating call Greg Talley at Comfort Solution, Inc. (817) 937-9740 or visit us at www.comfortproductsinc.com.